Some of the best base coat nail polish options offer the core layer for the nail colors and gel polishes. Usually, when you apply a base coat polish you surely get smooth and silky nails that are covered with a protective layer for covering the nails to avoid ridges, lines and strokes or lines on the nails. The base coat also serves the purpose of giving a stable base for the gel nail polishes or the nail color to stay on it longer without chipping. No matter if you need to secure your pedicured nails with a transparent base coat to protect your nails from getting damaged or if you are looking for complete coverage and protection and a fine base before you apply the color or gel based nail polish. It not only enhances the overall surface of the nail for better application of the nail polish but also protects the nail from getting damaged or chipping issues. Assuring that you will be getting a reliable base coat nail polish for the best look on your nails, we have listed a handpicked list of 10 best base coat nail polishes here. 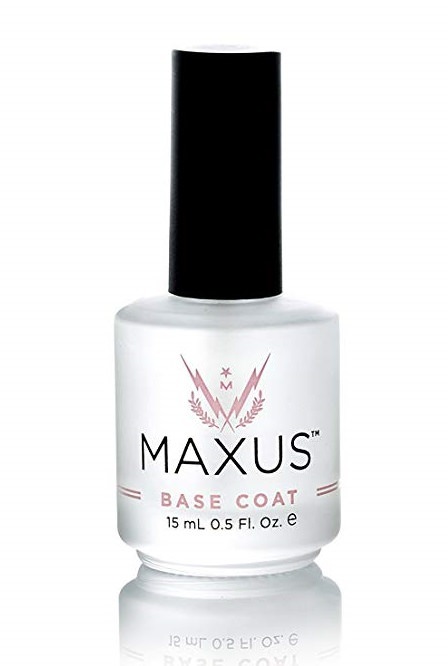 Maxus nails base coat nail polish offers complete nail coverage with easy strokes on the nails. It offers quick and easy spread without smudges so that you get a smoother silkier coat in one go. The special formula makes sure to offer strength and support to the nails that have become weak and brittle over time. In case if the nails are damaged, are peeling off or have become brittle due to frequent damages, this Maxus base coat assures coverage and protection for the best nails you could ever have. The base coat also supports nail health by providing an antiseptic effect with the help of Tea tree oil that protects the nails against fungal issues. It also helps in avoiding discoloration and staining of the nails. Since it’s a product made in the USA, it is totally animal cruelty-free and offers a safe and long lasting solution for keeping nails in their perfect condition. Most people prefer having their nail protected and covered without discoloration and brittleness being involved on the nails over time. For this purpose, the application of crystal clear, complete coverage base coats works like a charm for most of the nail types and conditions. 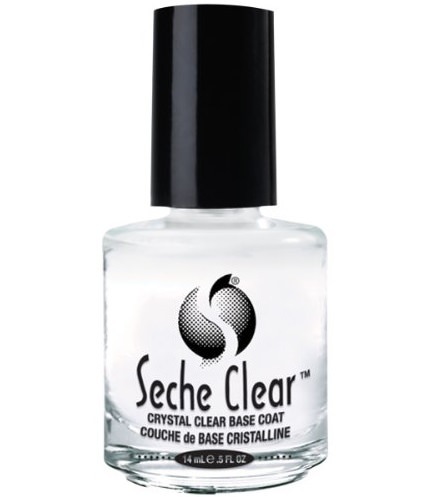 Seche clear base coat makes sure you get a full-coverage base coat on your nails that not only cover imperfections on the nails for providing a smooth and fine base coat for any type of nail color or gel nail polishes, but it also promises to keep the nail protected and secure. It is a stable base that maintains its crystal clear texture and offers no discoloration on the nails over time hence it will not get yellow after some time. 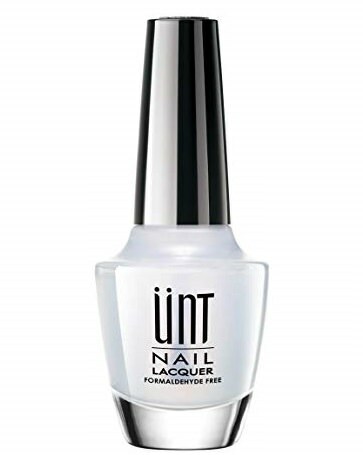 The base coat stays intact with the nail without getting shipped off and provides a perfect base that protects the nail as well as offer a perfect looking, long lasting base for the nail polishes. It is formaldehyde and toluene free. OPI excels in providing non-chipping base coats that actually serve to protect the nails as well as provide a clean and smooth base for the color nail polishes and gels nail polish. This one is a perfect foundation nail polish that is suitable for the OPI nail lacquer for a perfect finish and rich color. Anyone can use it for a long lasting protection of the nails and keep the manicured nails neatly maintained for days. The base coat protects nails from staining and discoloration or yellowing effect. You can apply the thin layered base coat for preparing the nails for nail lacquer and get the perfectly fine finish for long lasting nail protection and rich texture. 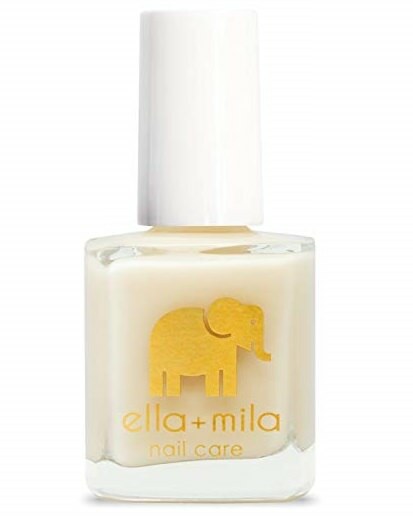 Ella+mila base coat also works fine with the nails that have been damaged, discolored or affected by the external factors. The base coat is perfectly formulated to provide a safe and secure solution to keep the nails away from the issues without further harmful effects. It is a ridge filler base coat that assures to cover the ridges, imperfections or brittle line on the nails for providing smooth and silky top nails for applying nail polishes easily with stroke-free nail polish finish. The base coat is totally safe and is animal cruelty-free so when you are using it, you are not violating any legal implications. It does not contain harmful substances like Toluene, Formaldehyde, DBP, and camphor hence is safe for you and the surrounding environment as well. 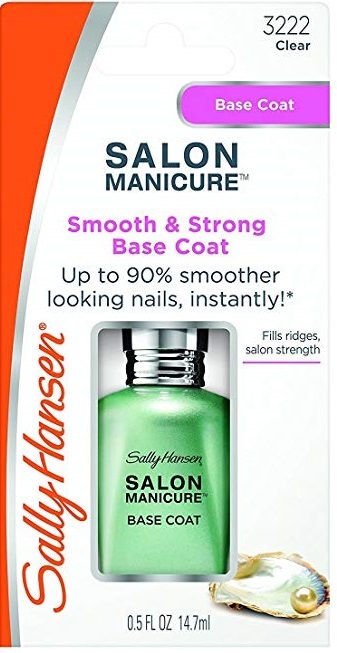 Everyone loves smooth and strong nails and Sally Hansen salon manicure base coat is meant to provide the nails a protective base coat for smoother, shinier and safer nails. The base coat offers a complete coverage on the nails so that the ridges and the imperfect nail surface becomes perfect. It gives the nails protection and would not get chipped off easily. This is a purely base coat similar to gel and makes sure to cover the ridges for a fine look either if you need to protect manicured nails or need a smoothing base for your nail color. It gives a salon like the finish on the nails that last longer and better. Whether you have thin nails, hard and brittle nails or split nails, this base coat make sure the nails appear smooth and shiny and give strength to them for avoiding most of the nail damaging issues. 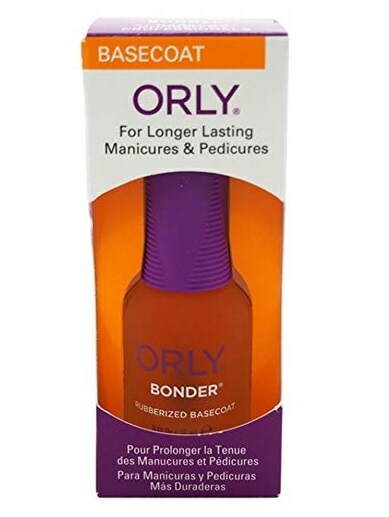 Orly Bonder base nail coat is a unique base that offers protective nail coat for providing a rubberized bind so that the nails are protected against damages and give a smooth, strong surface on the nails. The base coat assures a strong bond between the nails and the nail color for a long-lasting effect. It offers strong cover on the nails that assure no-peel nail color and prevents shipping and wear or tear problems on the nails. It can protect nails and keep the bond with the nail colors for up to two weeks without any issues. The base coat enables you to get a salon finish with smooth and shiny nail look at home. UNT is ready to take off the base coat that offers easier application and make sure it is easy to peel off from the nails when needed. It can use as a manicure protection or a nail color basecoat. The base coat offers complete coat on the nails that make it easier to use the hard-to-remove nail polishes and glitter. With this peel-able base coat, you can easily remove any kind of glitter and nail polish without damaging or ripping off your nails. It is basically a 10 free formulation that assures there are no harmful products like formaldehyde, DBO Toluene, etc. It is a clear base coat and offers protection and a smooth surface for color application and nail art. 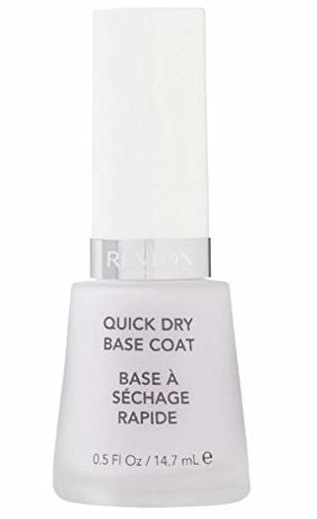 The Revlon base coat consists of an acrylic formula that covers and coats the nails properly for a glossy finish on the nails. It is a high gloss, complete coverage formula that covers the nails to keep them protected and make sure it would not get chipped or damaged easily. It includes plasticizers and acrylic polymers for glossy, salon like finish. It dries out quickly and makes sure to provide a strong base for keeping nails safe. 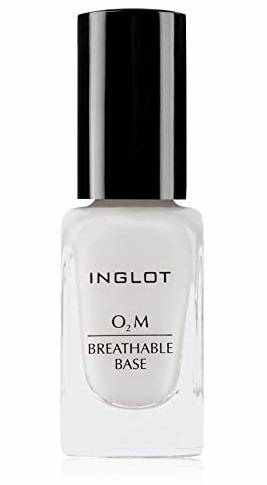 O2m base coat by Inglot is a unique breathable nail base coat that offers high-tech nail beauty using the polymer ks-02. This polymer is usually used for the contact lenses assuring crystal clear finish. With this polymer, the breathability is increased and offers perfect glossy shine on the nails as well. This helps in strong bonding with the nail colors and varnish spread and offers reduced tightness. The improved oxygenation offers better nail health as well. This is another nail care base coat that offers clear yet slightly pink nail coat for a natural nail finish. It is free from the harmful substances like formaldehyde and toluene and camphor as well. So it is totally safe to use and provides care for the nails without any hazards. It provides flawless yet effortless manicure finish that lasts longer and keeps the nails protected against damage. It would not chip or wear off for days and provides a strong and stable base for the nail color as well. It is a perfect primer for the nail polish to keep it stay on the nails for a longer period of time. For ladies who are looking for a perfect finish for their manicured nails, or need a no-chip base for the nail color, the above-mentioned list of 10 best base coat nail polish options would work as they need. Most of these base coat nail polishes offer high-end, no-chip protection and also assure to fix ridges and imperfections with just one coat on your nails.